The two hearts that accompany your wording on this non-folding white invitation artistically say "Sent with love" to all your guests. Your names are printed in the heart design in the typestyle and ink color you choose for the wording. Paper weight is 171 lb text. Inner and outer envelopes are included. I ordered invitations for my wedding reception. The ink color looked just as I expected. Paper quality was nice. And the price was affordable. The icing on the cake is the many compliments I have received about the invitations. Feel for a tight budget this was an ideal product. The print color was perfect and matches my wedding colors. The inscription on the invitation could not have been any better, excellent. Product arrived quickly and was just what I expected. Ordered these invites for wedding in September, they were beautiful! Everything I expected and more! Delivery was fast! 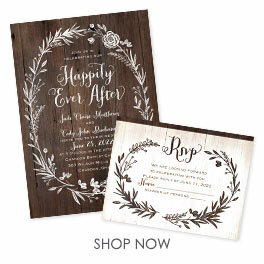 Great wedding invitation at a great price! The product was exactly as described. It was beautiful. No errors in what we requested. We asked for something "different" on one of the cards and they understood our request. the lightweight cards made for inexpensive postage. The silver ink looks really cool and metallic. Overall good quality. I didn't want to spend a lot of money on invitations because people just throw them away once the wedding is over. I love the simple, yet elegant design of the With Love invitations, and that I was able to customize the color, font, and wording to fit our wedding theme. The paper weight is just right. We ordered these invites for our daughters wedding and are very pleased with them.She wanted white with silver ink and they are just what she wanted.We were suprised to find that the silver ink has a irridescent sparkle to it,which added to the look.We did have an issue with the printing as the bride and groom's names were printed in the wrong font,but we called and it was taken care of immediately!Also there is a faint crease at the top of the invite which is un-noticeable(except to me).